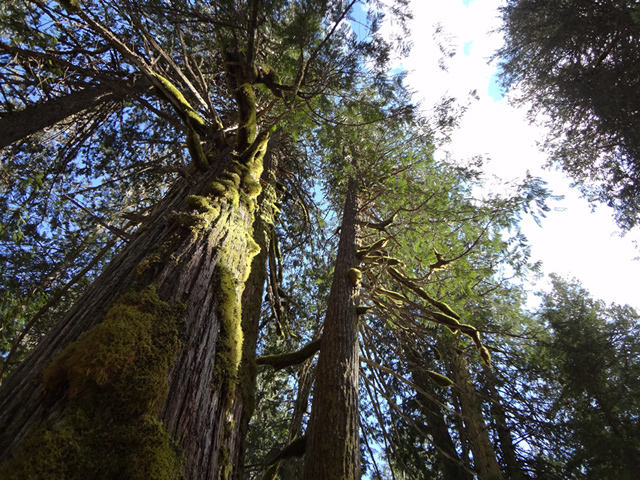 The Ancient Forest/Chun T’oh Whudujut Park and Protected Area is British Columbia’s newest park and is quickly becoming one of the “must do” parks to see and hike in British Columbia. Nestled in the traditonal territory of the Lheidli T’enneh, the park protects a portion of the only inland temperate rainforest in the world. Hiking the Ancient Forest trail will bring you past thousand year old western redcedars and a rich biodiversity of plants, mosses, lichens and fungi. The 450 metre long universal access boardwalk provides the opportunity for people with all abilities to experience this majestic area. Another 2.3 km of boardwalk provides access to magnificent “Big” Tree, Tree Beard, Radies Tree and a beautiful cascading waterfall. Established Date: May 19, 2016 for the park and June 13, 2016 for the protected area. No overnight camping is allowed at the Ancient Forest parking lot or the Driscoll Ridge parking lot. Overnight camping is available at Purden Lake Provincial Park located 50 km west of the Ancient Forest / Chun T’oh Whudujut Park. Smoking is not allowed on the Ancient Forest trails. This park and associated hiking trails are located midway between Prince George and McBride on Highway 16. It is about 115 km east of PG on Highway 16 and 103 km west of McBride. The nearest cities are Prince George and McBride. Conservation: Ancient Forest/Chun T’oh Whudujut Park is situated within the interior wetbelt of British Columbia. Western redcedar up to 5 metres in diametre and perhaps 2000 years old can be experienced along the boardwalk. Over 400 plants species also call the Ancient Forest home. The Ancient Forest/Chun T’oh Whudujut Park also protects rare and endangered plants species such as the Joe-Pye Weed and many others. This park is maintained by the Caledonia Ramblers Hiking Club from Prince George. Support for the Ancient Forest and the Caledonia Ramblers can be directed to: the Caledonia Ramblers Trust – Friends of the Ancient Forest or the Park Enhancement Fund. Lheidli T’enneh partners with BC Parks to protect this area and ensure the values of this area are maintained for future generations. The Universal Access Trail is approximately 450 metres long (one way). The boardwalk will enable visitors in wheelchairs, those with other mobility or mental health challenges, and everyone else to experience the only inland temperate rainforest in the world that is so far from the ocean. Ancient Forest Boardwalk Trail is 2.3 km long and provides users with a close look at the unique inland temperate rainforest of British Columbia. Driscoll Ridge Trail is a strenuous trail 15.5 km long loop which brings you to the ridge line on the south side of the park. This trail should only be attempted by experienced, well prepared hikers, in good physical condition. This protected area is partially open to hunting. Highway set back closures are in effect as well as 400 metres from a park road. Please refer to the Hunting & Trapping Regulations Synopsis for more information. Pets must be on leash on the Ancient Forest boardwalk trails. Please take additional care when meeting other people or pets to avoid any conflicts or issues. Backcountry areas are not suitable for dogs or other pets due to wildlife issues and the potential for problems with bears. If your pets are accompanying you, they must be on a leash at all times, and you are responsible for their behaviour and must dispose of their excrement. Snowshoeing on the Ancient Forest Boardwalk Trail is a great way to see this site in the winter. Limited winter parking is available. This park has universal access pit toilets – no flush toilets are available.